I finished illustrating a fun skeleton book last month, have almost finished a flowery watercolor book and am preparing to begin a book about athletic animals from A to Z. Each one is quite different, and it makes it interesting to move from one subject and style to the next. I have been thinking about how different my oil paintings are from my illustrative work. It seems that some things in life are good for you, but take more brain or will power. Things like eating healthfully, exercising, learning new things. For me the things in this category are making sure I do some sort of aerobic exercise, trying not to eat too much chocolate and reading fiction books. My oil paintings fall in this category, as well. They are more work, they take long to finish (especially lately) but I know I learn a lot from pushing myself to complete each one. Illustration is in my easy, more enjoyable category. I can just sketch out an idea on paper, and a few minutes later have the paint flowing. It is so nice to have the two types of art to balance things out. As all life should be: a balancing act. What is your easy style of art that you make to relax? Do you have a style that requires more of your energy? Man, do I ever need this challenge! I hadn’t really stopped to think about my lack of working from life for my art. But this challenge made me stop and consider it more. I think 90% of the time I have been using photos as sources. Photos have their use for artists; there is no denying that. It’s really hard to achieve realism using life sources only. And for busy moms and dads, using photos can be much more doable than using real props or breathing models. But, this actually made me think deeper about my art. 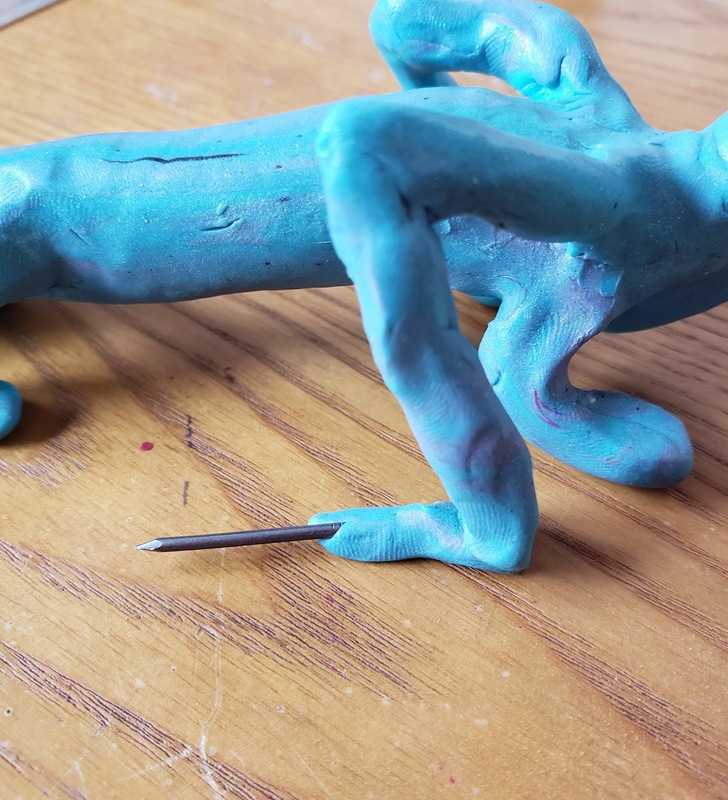 Why do I make art? Is it fun for me anymore? What do I hope to achieve with my art? Before I had my youngest two kids, I had lots more time to work on my art. At that point, my goal was to get as close to photo realism as possible. I worked at my technical skills, and get so frustrated when my paintings didn’t look exactly like my photo sources. That has changed. I read once about the bakeries in Paris during the 1800s. The book said that the bakers were shirtless, and the ovens were very hot. So inevitably their sweat, grime, ashes (you know they were smokers!) and who knows what else would get mixed into the dough. They literally put a bit of themselves in their loaves. That’s how I want my art to be. Not just a copy of a photograph. It might look like I’m regressing in my art skills, but I’m alright with that if I can make real art. The art I made when I was a kid and didn’t care at all if it looked like a photograph. I’m working on several art projects right now. My main project is illustrating a children’s book. But, I am also working on a few paintings in preparation for an art show in August. I’ve been illustrating books since 2012. I’m getting much better at the process. At first I really had no idea how to go about it. I would just start drawing the first page and hope it would all work out. Now I have steps that I go through and it makes it much easier. I first sketch out the main characters in a couple different poses until I like the way they look. Then I read through the manuscript a couple of times to get a good feeling of the mood of the book. I make a thumbnail sketch for each page, making sure to leave blank space for the text. I made the mistake of leaving no blank space with my first book and had to redo all of my work. I also learned to not put anything important close to the edges, as it will be cut off in the final book. Right now I am illustrating a cute book about a skeleton and my favorite color is involved. The cool thing about this book is that the author gave me the freedom to make the illustrations however I want. It’s really exciting to get this chance. I always enjoy illustrating, but it can feel like it’s not even my work sometimes. Some authors want a particular style for their books and while I can mimic different styles, it just doesn’t feel like my art. I have an art show coming up in August, so I’ve been busy trying to get some paintings done before then. Above is one of my middle daughter that I have about half done. She is a huge animal lover, so I had an idea to paint her with some of the feathers she has collected. I also have some similar paintings of my daughters with brightly colored scarves, and I want to bring some of my sunrise paintings. Is anyone else an early bird? I love waking up early. Every morning I wake up so excited to start a new day. Maybe that’s why I love painting sunrises. And even though we live in a rather slow country town, the sunrises here are just as amazing as one you’d see on a tropical beach. So, I end up taking pictures and painting them quite often. This is one that I started yesterday. Pre baby I would be able to finish it within a week. But with the baby? I’ll be happy to have it done in a month. Babies are a little more important than a piece of canvas! I have been doing the sketches for the book that I’m illustrating in ballpoint. So I did a sketch of my daughter in ballpoint a few nights ago, just for the heck of it. When I was a kid, I despised drawing with ballpoint pens! They made me very frustrated. But, I have seen some very cool artwork made with them. You don’t always need expensive tools and materials to make beautiful art! Besides these drawings and paintings, I am working on my June life drawing challenge. I will put the first week’s drawings up here on Friday! 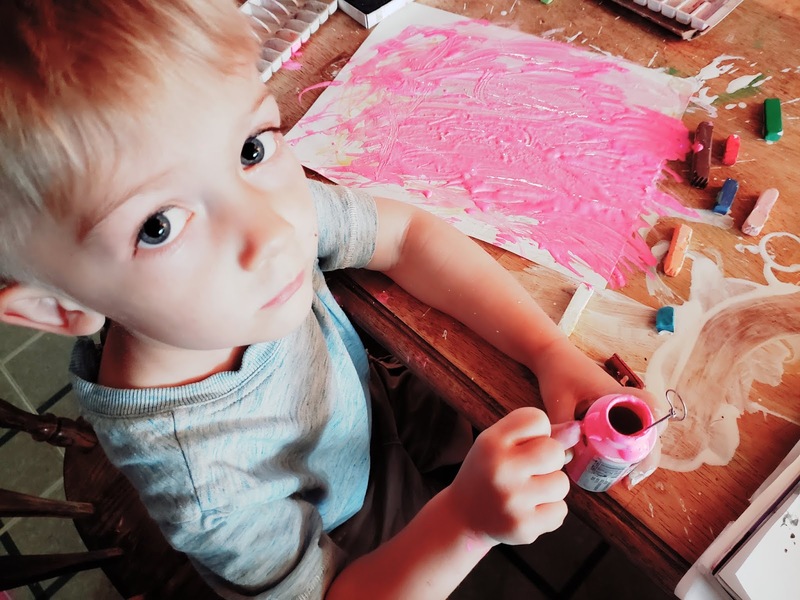 Today we are doing a kid project: lake paintings! While water can be a challenge to paint and draw, it can also be very satisfactory. Kids especially, seem drawn to artworks depicting water. I remember loving Monet’s paintings of ponds and lakes when I was a kid. One of the trickiest parts about painting or.drawing water is getting the mirror image of the reflection just right. 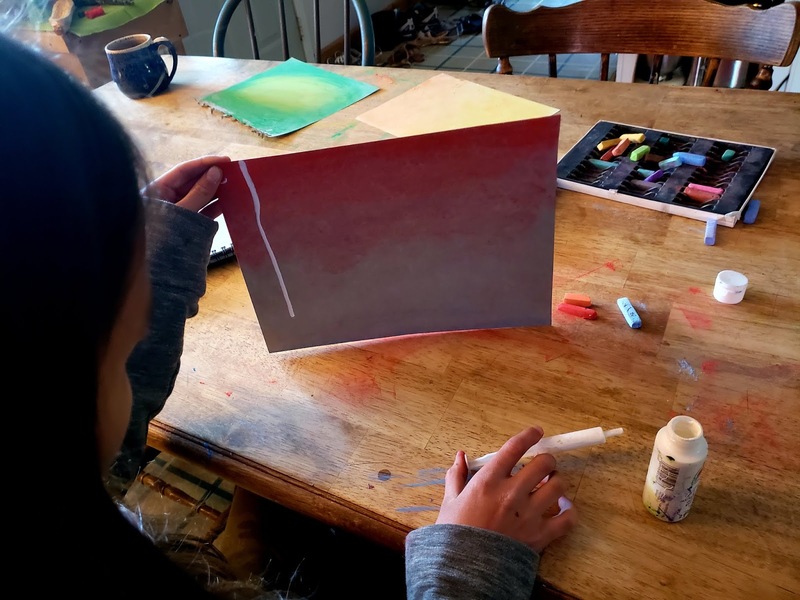 With this project, the mirror image is created by folding the paper on half. When you open the paper back up, your watery reflection has been made! You can use this as a lesson for teaching mirror images and symmetry, or just as a fun art project. That’s up to you! If you homeschool and are teaching symmetry, this would be a very fun way to demonstrate it. I would say 5 year olds and up would be able to handle this project. Older kids might like to add details at the end. First, take your piece of paper and fold it in half. You can fold it vertically or horizontally. Either way works! Open it back up. Paint only above your fold line with sky colored paint. Make sure the paint is thick and rather wet. 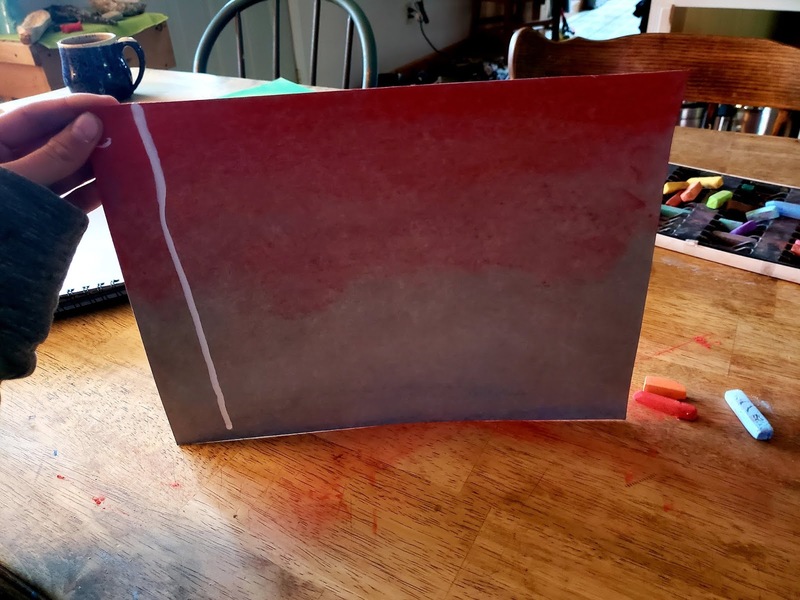 Quickly, before the paint can dry, fold the paper in half again and press down where you’ve painted the sky. Open it back up. You should now have the “sky” and the reflection of the sky below in the “lake”. If you use dark paper, you can leave a middle area blank. That will be the forest line above the water. Once you’ve painted your clouds, fold down and press your paper again. You can also do a night scene and add moon and stars to your sky. See how there is a perfect mirror image of thr moon and stars reflected below? Now add some green right above your fold line. This represents the trees living above your lake. Fold and press again. You can add details like birds flying the sky or lilypads floating in the lake if you’d like. Otherwise, you are done! I want to start doing monthly art challenges. For the month of June I will be doing a drawing from life every day, and will post a weekly round up of them every Friday. I think drawing is a skill that should be worked on continually as an artist, even if you work primarily in another medium. Drawing is the bones of art, and drawing from life is even better. I haven’t been doing enough work from life lately, so I think this challenge will help me improve . Would you like to do this challenge, too? Send me your drawings, along with your name and/or website, to kimberlyjart@gmail.com or fill out the form below and I will post your work in my weekly round up! But, what if you really want to be a full time artist? It is possible to make an income as an artist, but the term starving artist didn’t just come from nowhere! You have to work very hard, both at your art skills and at your business, in order to make decent money as an artist. This strategy has worked every time I’ve tried it. Let’s say that you paint a lot of deer, go to hunting forums and websites and show them examples of your deer art. Or you can just start posting, and have a sample painting and website on your signature. I live on a hobby farm and have lots of opportunities to sketch and paint our animals. By going on farming and homesteading forums, I sold two paintings and got a commission with just one post! Identify the people that would love your art and bring it to them! Chances are, at the right price, you will sell something and may even make valuable long term customers! I’ve had my artwork hung up in lots of coffee shops, restaurants and bars. I’ve made a sale in all but one of these, and the best part is that it is usually free. It should be seen as a sort of mutually beneficial agreement. The shop gets free wall decor and you get your artwork out there and possibly some sales! It’s a very low risk way to market your art. Just make sure every piece is framed and wired, and that you identify the artwork in some way with your contact information. If you frequent any little shops, just ask! The worst they can say is no. Almost all of the large publishing houses get innumerable submissions. I’m not saying you won’t get hired, but the chances of it aren’t very high. It also takes a lot of effort to send in the mail packets that some of them require. Online submissions are so much easier, so I always try to stick to places that accept them. If you can find any local, smaller publishers give them a try! Not only will you be supporting a small business, you also increase your odds of having your work looked at. There are some franchises that offer art classes to after school kids and don’t require a degree. Before we moved way out in the boonies, I got hired to do these classes. Unfortunately, I never got to teach any since we ended up moving that summer, but I think it would have been great fun teaching kids art and making a little money in the process! You have to use some caution when using Craigslist, as there can be scammers. But there are some cool opportunities for artists on here. I’ve found some unique ways to make money with my art from checking Craigslist, from cafes looking for some art to display to even getting my first solo show at a gallery! This really shouldn’t be passed up if you are trying to find new ways to get your art out in the world. Just use common sense, and if it sounds too good to be true, I’d say steer clear. Have you found any creative ways to make money with your art? Ok, today we are making out of this world, crazy, outer space landscapes! This project is for older kids, I’d say 7 and up. I think middle schoolers are the perfect age for this. But younger kids can certainly paint alongside! It is so fun seeing the different planetary landscapes at the end. They all turn out so different! Sky colors. You can go wild! First, add a colorful gradient across the top half of your paper. Remember, in outer space skies can be very creative colors. No need to stick to blue! Use pastels and blend them together with your hands or a soft cloth. 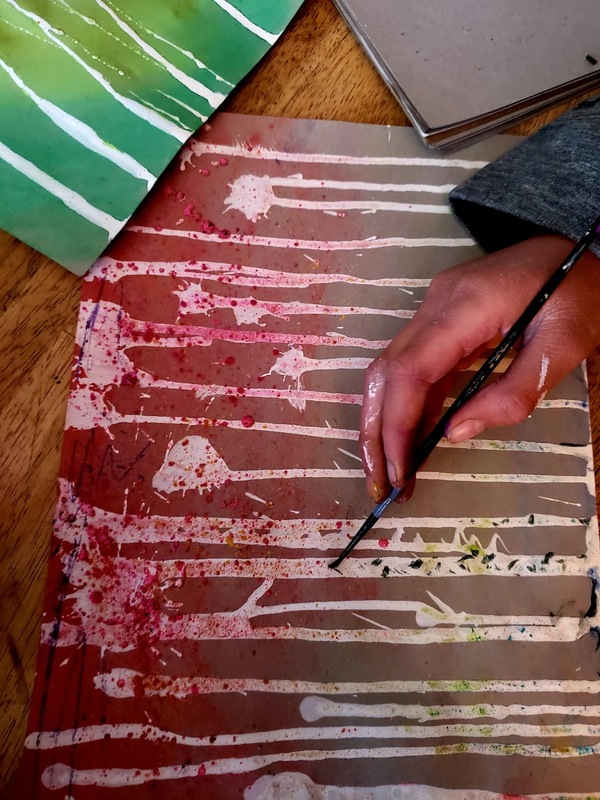 Next, use your thick brush to cover the bottom half of your paper with the tempera paint. 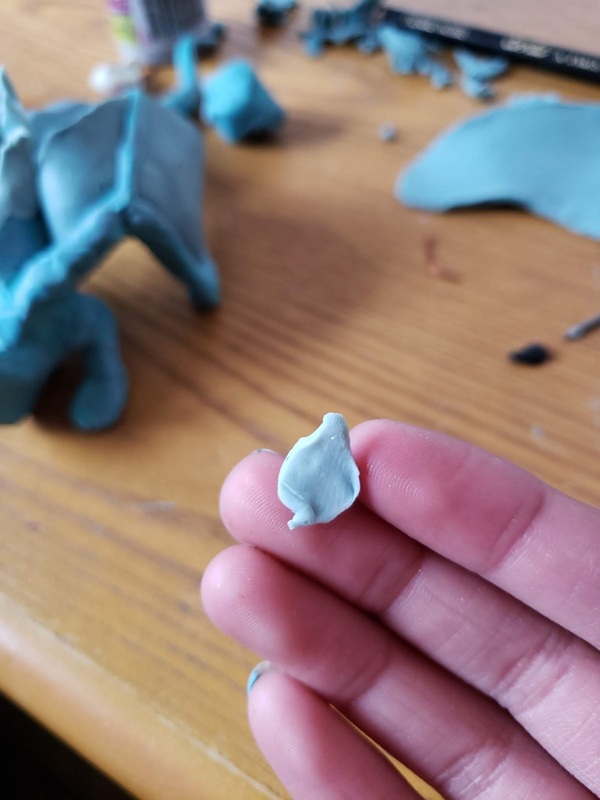 Let little bumps and overlaps stay instead of smoothing it out. These make for perfect craters and mountains later! Or, you can skip ahead to adding details like my daughter did below. Using the charcoal and stump, add planet bumps and craters. Try to remember that one side should get shadows, and the other side will get highlights at the end. Pick which side the light source should be coming from for your planet and stick to it. Next, add planets and moons to the sky. Using a white colored pencil or charcoal pencil, add highlights to one side of your shapes. This makes your planet really pop! This planet looks more fun than Earth! Your planet is complete! Hang them up and dream of life on your new creation. Which planet would you choose? I’d love to see any planets that you make! Hey there! 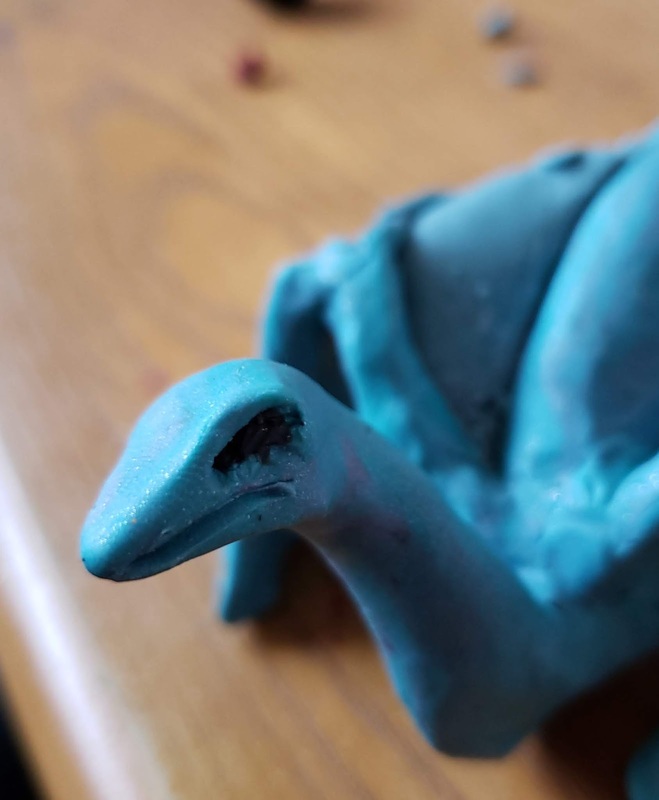 Today we’ve got a guest artist here demonstrating how to make beautiful dragons from clay. 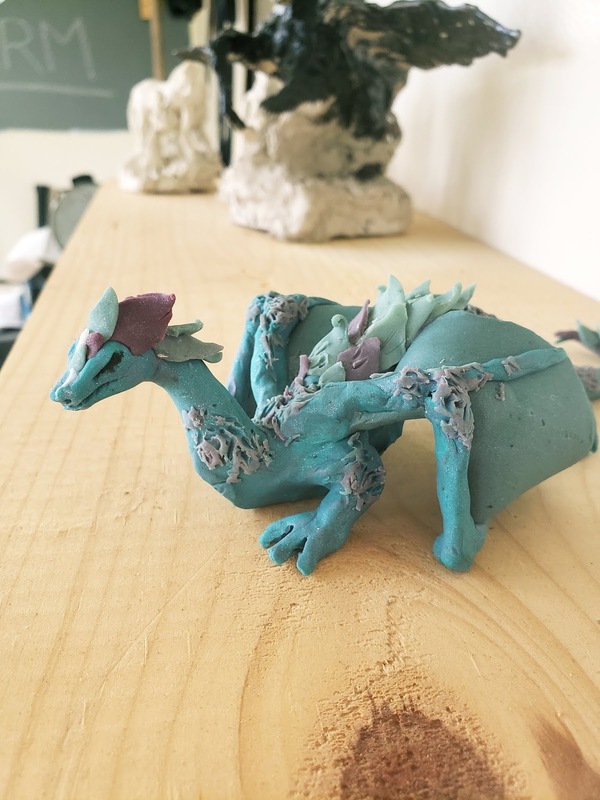 I hope all of you fantasy and dragon lovers out there enjoy this sculpting tutorial! Hi, this is Lina, Kimberly’s daughter. 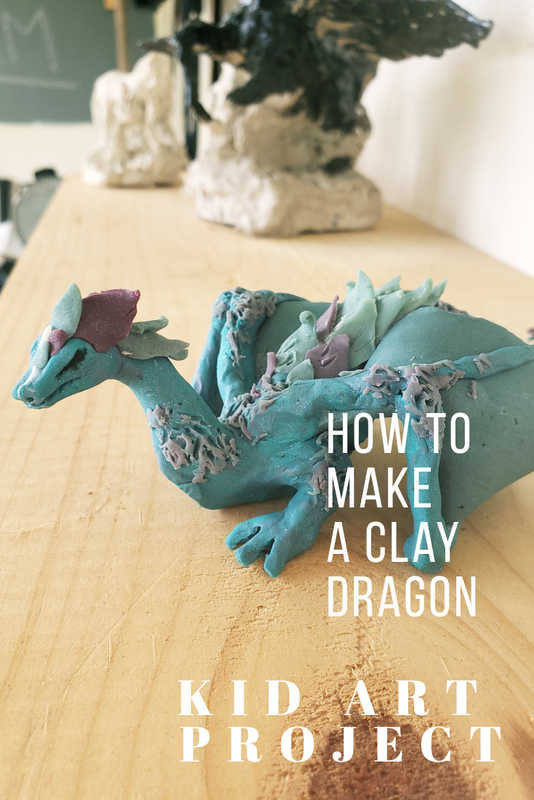 Today I will be showing you all how to make a sculpey clay dragon. Are you ready? 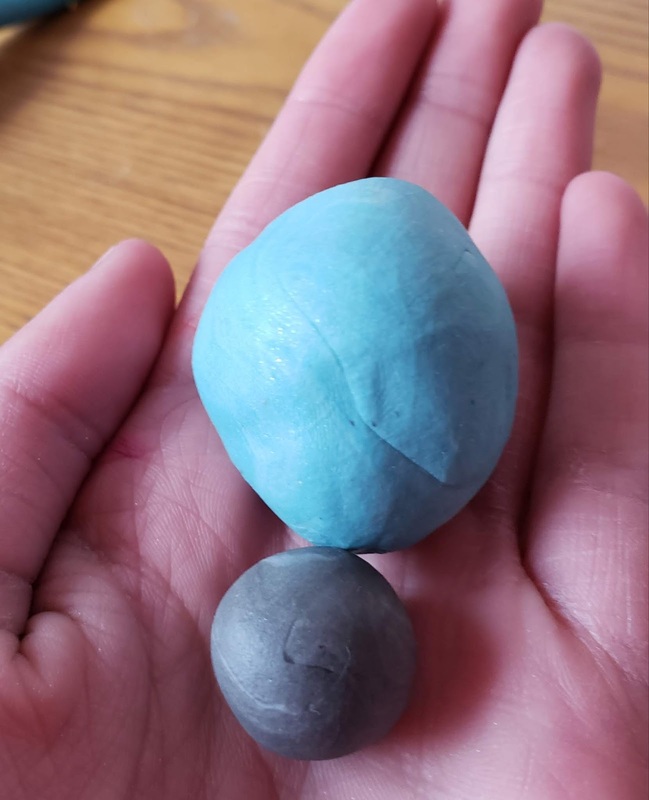 Okay, first step, you have to have at least two colors of bakeable sculpey clay. I used five colors, but as long as you have two, you will be okay. 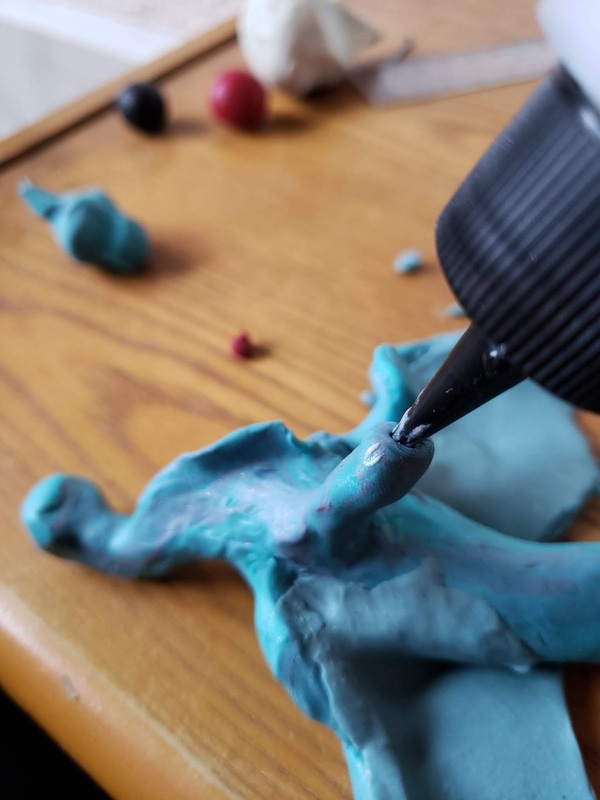 Oh, and also, if you want an exact replica of mine, (which you don’t) or if you just want to make it more exciting, add some glow in the dark sculpey clay. That stuff really has a wow factor. Anyways, to the second step. 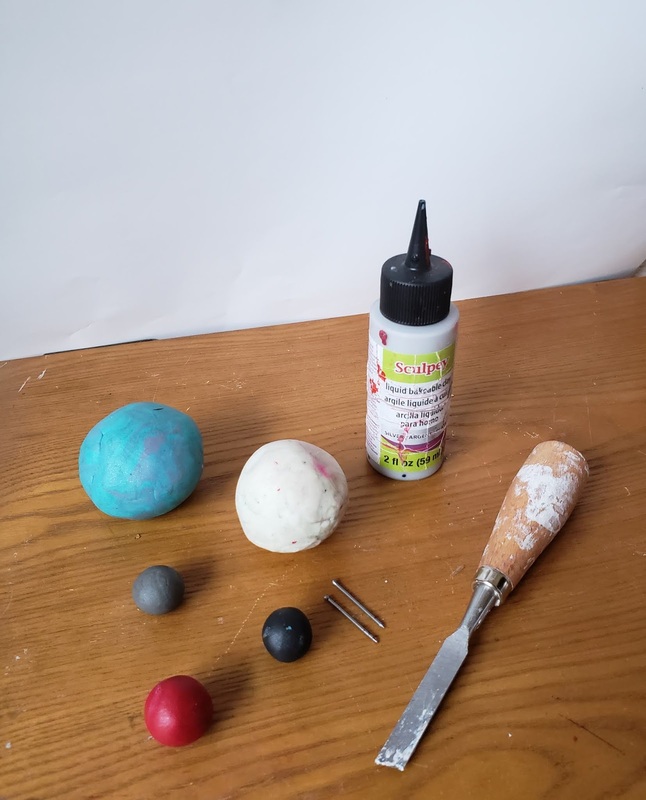 After you have your colors, get your main color and roll it out as seen in the picture. Taper it out at the end like a long tail. See the picture below. 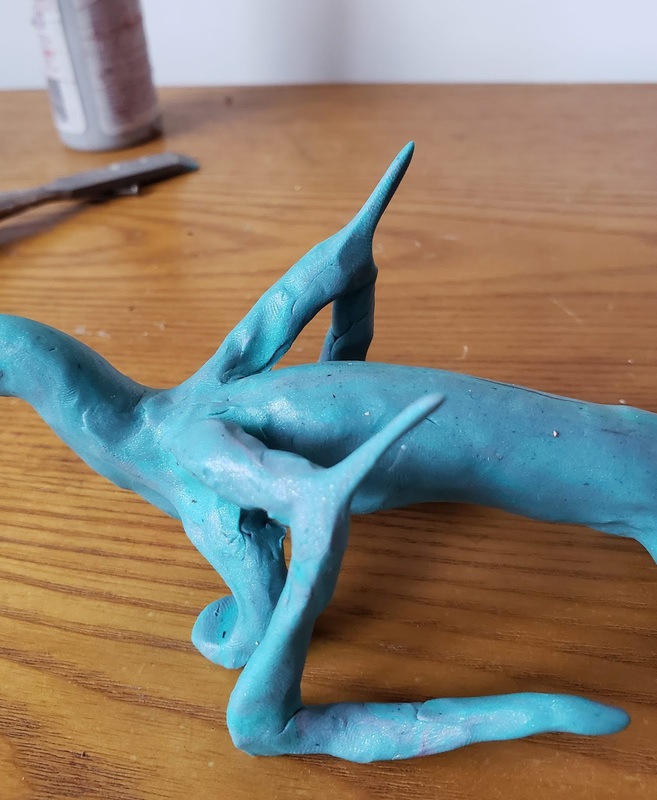 Next, mold the shapes of the legs, arms and neck. 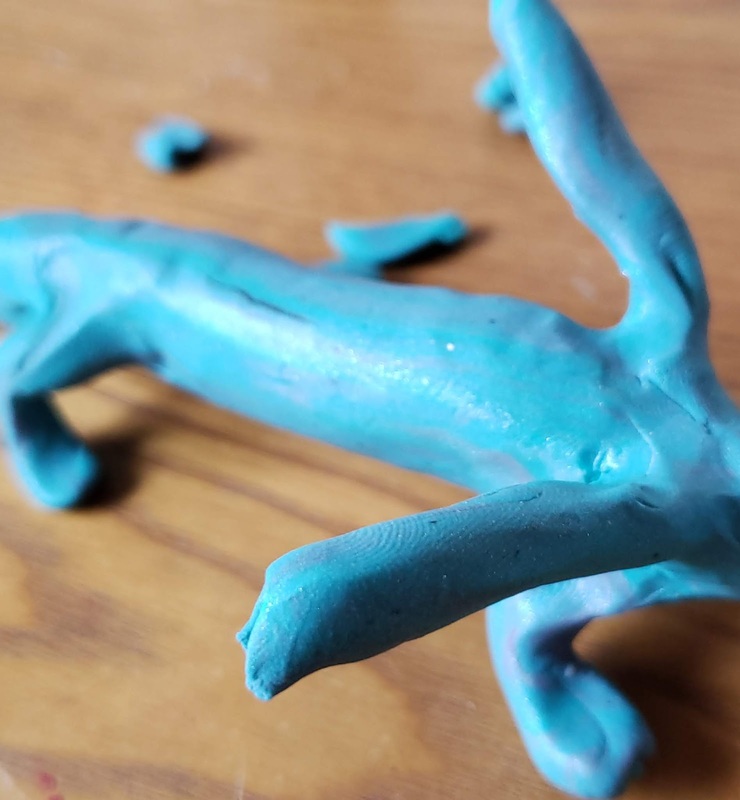 Were you would like the legs to be, pinch and draw out extra clay. 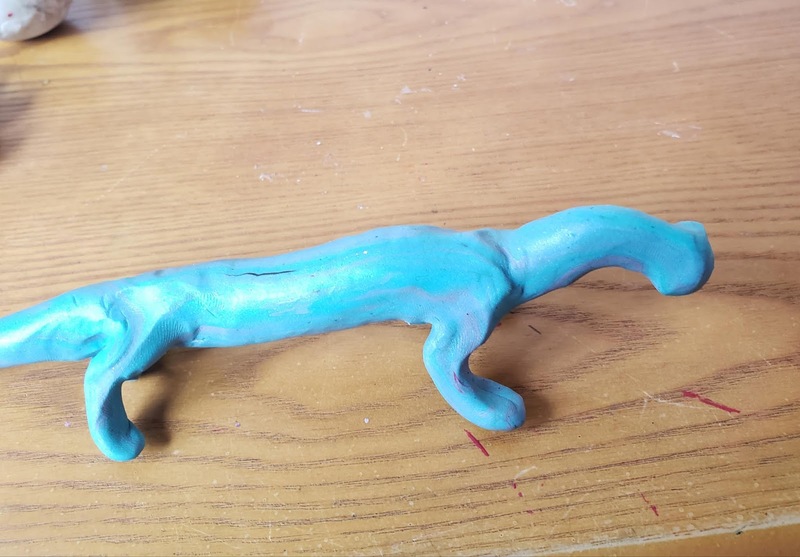 Shape the legs so that they bend like lizard legs. Poke two tiny nails into the shoulders. These will serve as anchors to hold the wings in place. 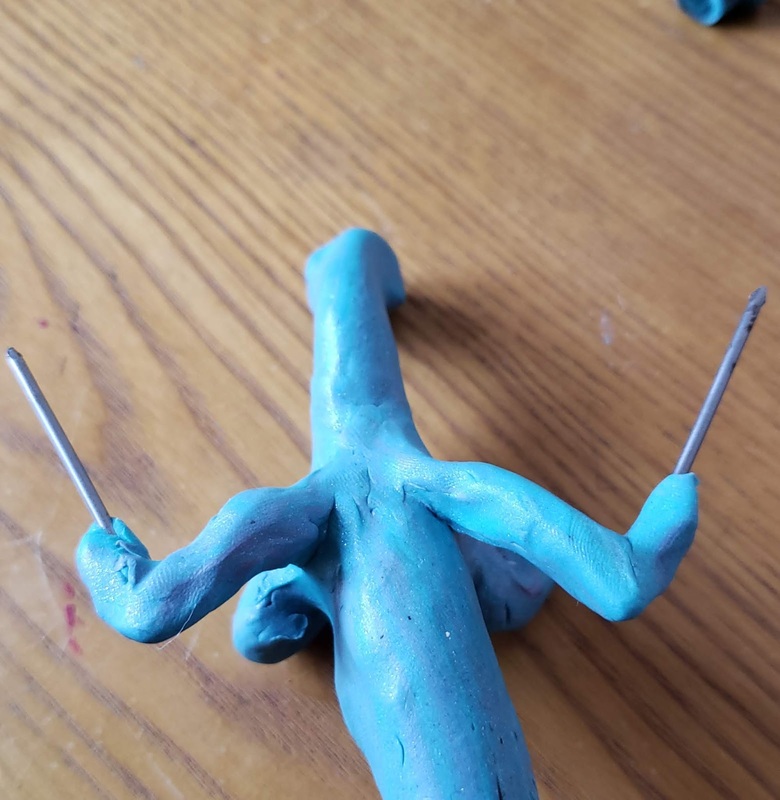 Add clay pieces to the nails, so that the wings have a top bone going across. This part shouldn’t be very long. 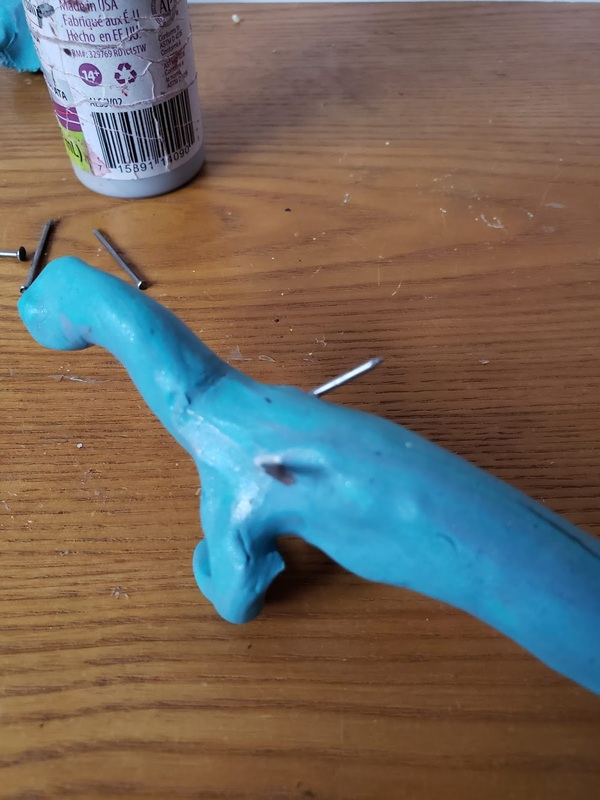 Next, add two nails to the wing bone, but point these nails forward. 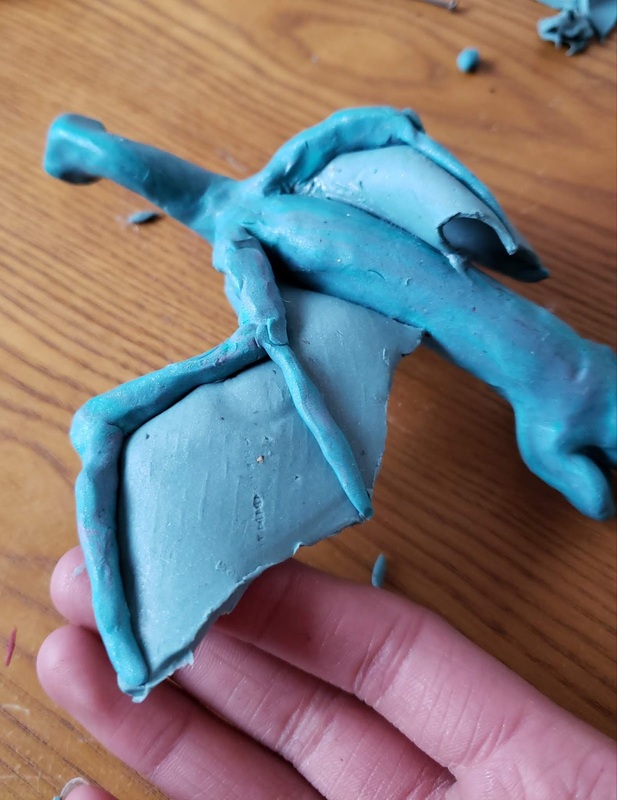 This will give the wings a very dragon-like shape. Then, form clay around those nails and extend them a bit until they are the desired length. Once more, add nails but face them back towards the tail. Now add spurs to the first joint. No need for nails here, just clay is sufficient. Now, mix in some glow in the dark clay (If you like!) 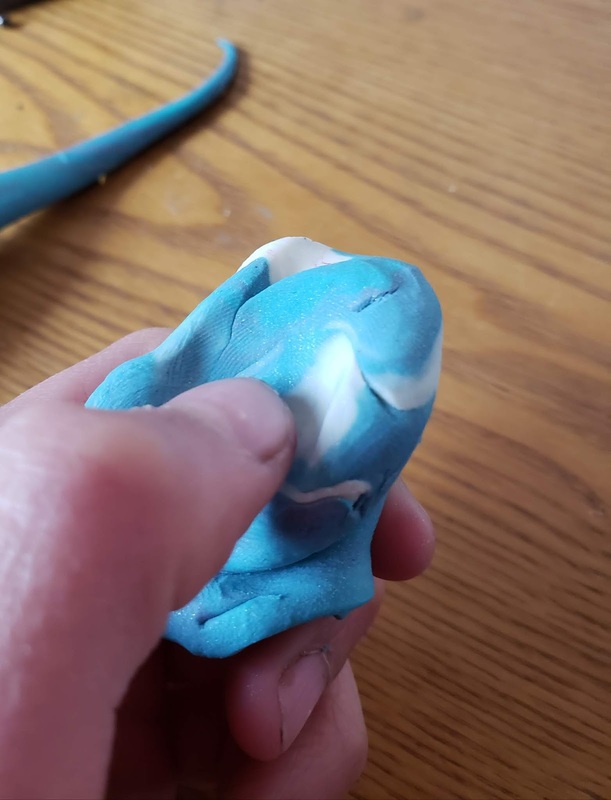 I do a ratio of 3:2 regular clay to glowing clay. I also added a ball of black to darken the wings. This helps them stand out against the body. You can see the proportions I used in the picture. Roll this mixed clay into a thin sheet. You want it to be about 1/16 of an inch thick. By placing it on the wing bones, you can see the shape it should be cut out to. 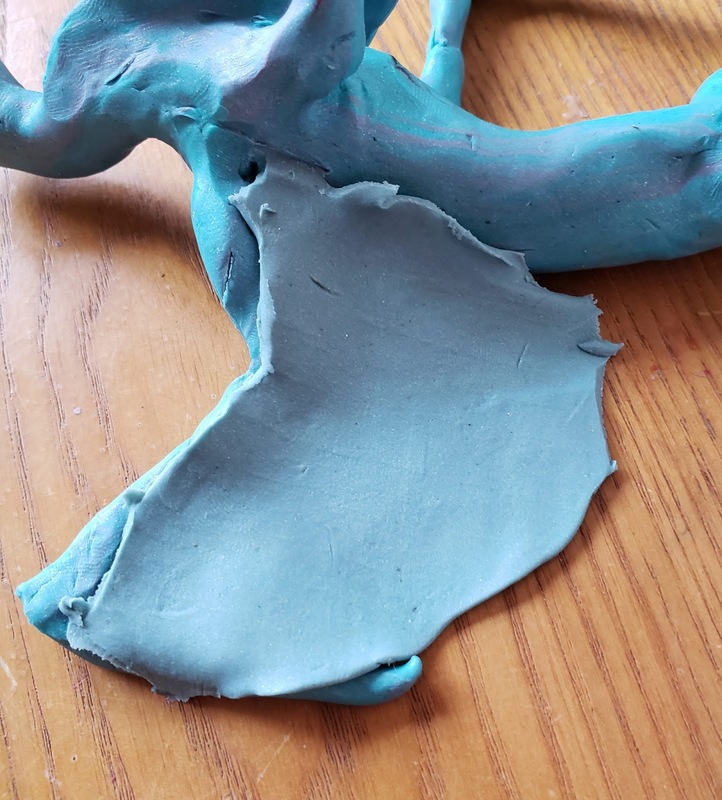 Carefully cut the clay into a wing shape. Press the wing shape onto the wing bones. Then, add a bone that bisects the wing. It should look very dragon-like already! Add details to the head. You can make the face featureless, or add details. I like to add details to show their personalities. 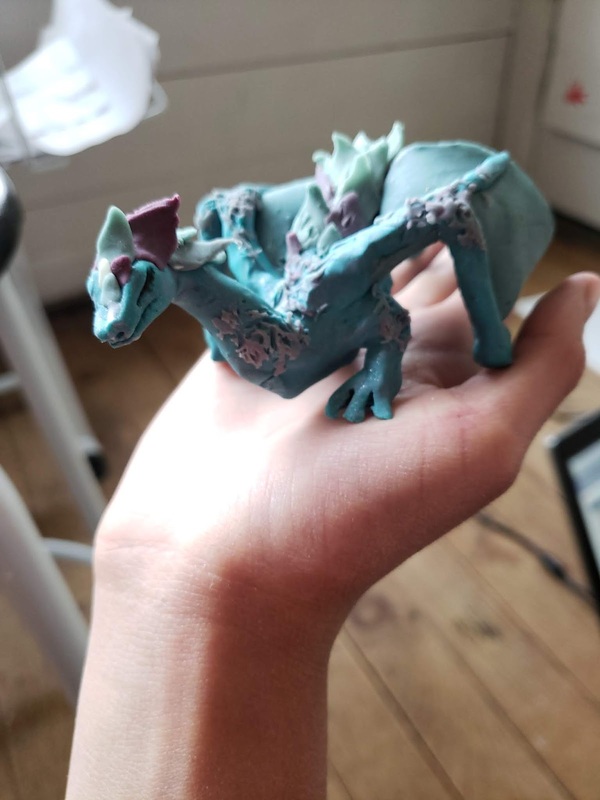 If you like, you can make tiny scales to add texture to the dragon’s skin. 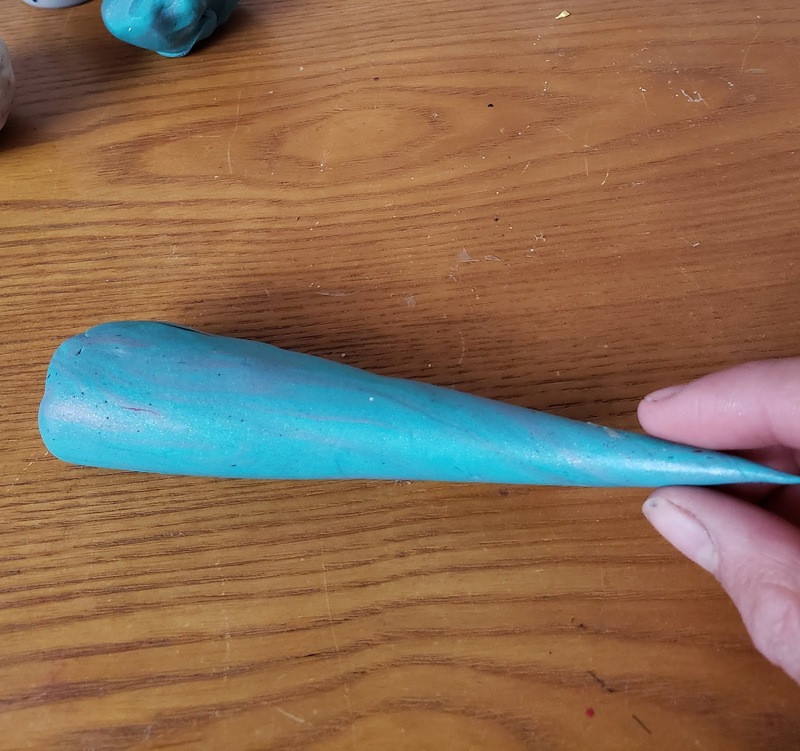 Here I used a mix of the blue and the glow in the dark clays for the scales. Keep layering the scales on. You don’t have to cover the entire body. Even a few scales placed around your dragon gives a very cool effect. 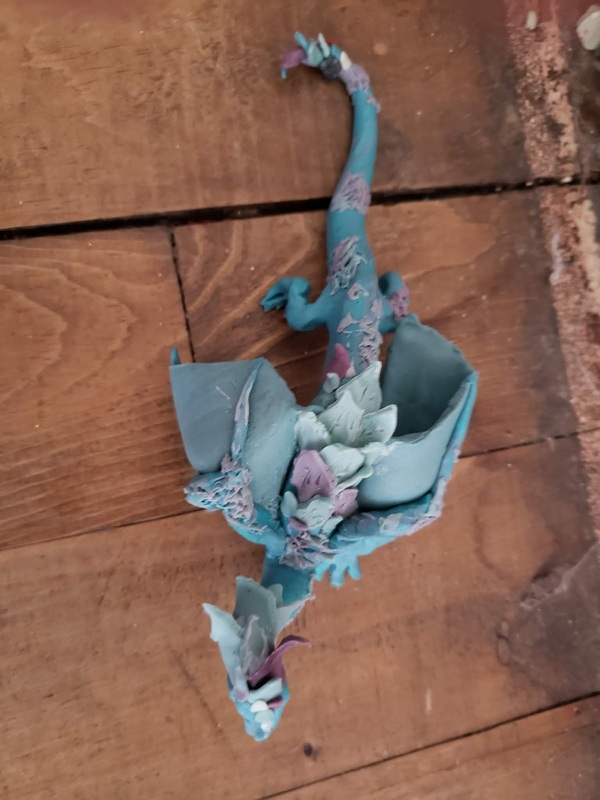 I also added some colored textured parts to my dragon. 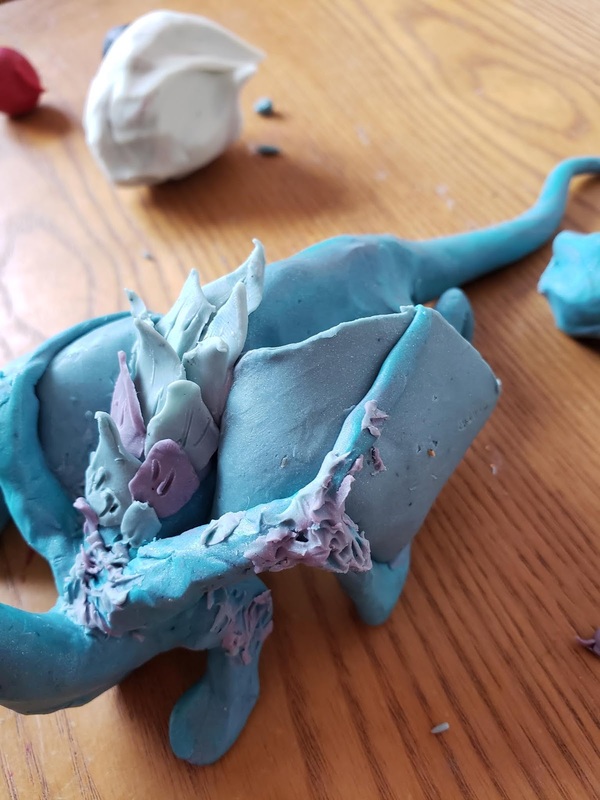 To do this extravagant part, you must roll out a thin layer of clay, stick it on the dragon, and poke a nail in it until it looks like the picture. And here she is! All you need to do now is bake your dragon. I baked mine for eight minutes in a toaster oven. The temperature should be at 225 Fahrenheit. Enjoy your new fiery friend! 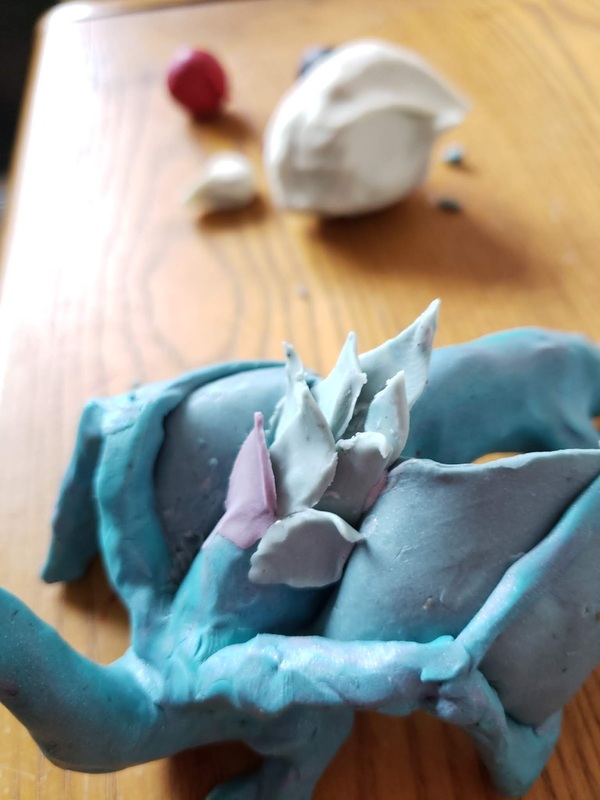 Today I’m going to do a kids’ art project. We are making painted birch forests today! I always loved the look of birch trees. They look beautiful in all of the seasons, with their silvery bark. 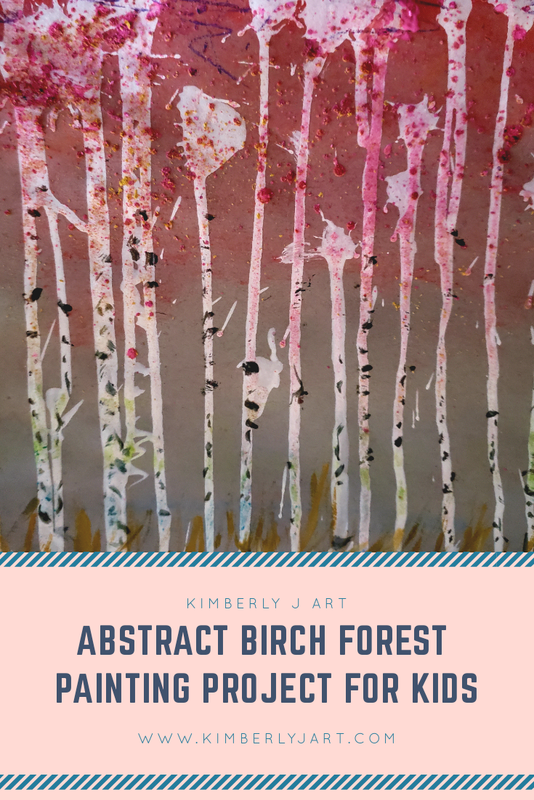 So, I wanted to create a birch forest inspired art project for the kids! First, look at photos of birch forests for inspiration. Or, if you’re lucky and live by one, walk outside and observe the colors around the birch trees. It depends a lot on the season, but there can be gold, green, blue, grey and more. 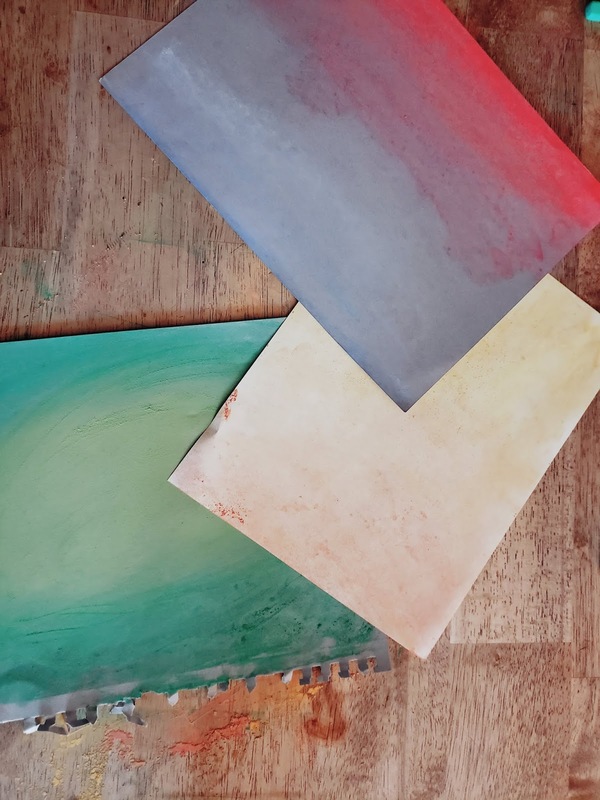 These are the colors you’ll want to make your paper be at first. So cover that paper with your desired color of pastel. You can also do ombre colors, which turns out very cool in the end. 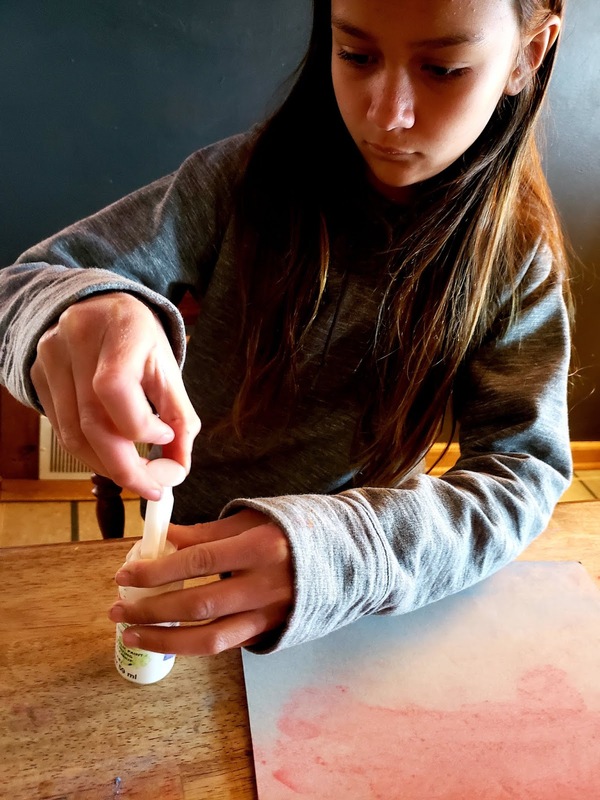 Next, get some white acrylic paint and mix it with a little water until it is a pourable liquid. Hold your paper up, and use the syringe to gently squirt the white paint across your paper. 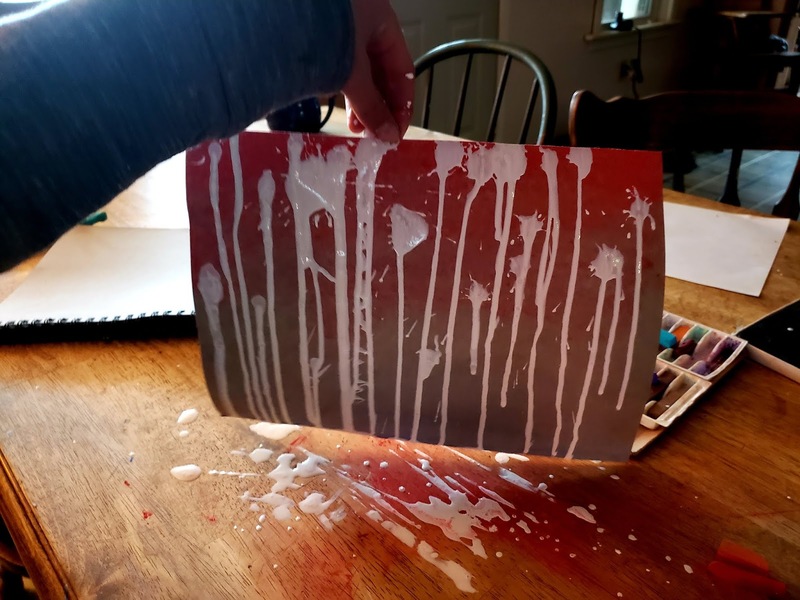 Hold the paper upright until the paint has gone to the edge of the paper. Sometimes it won’t reach the end, which is fine, too. 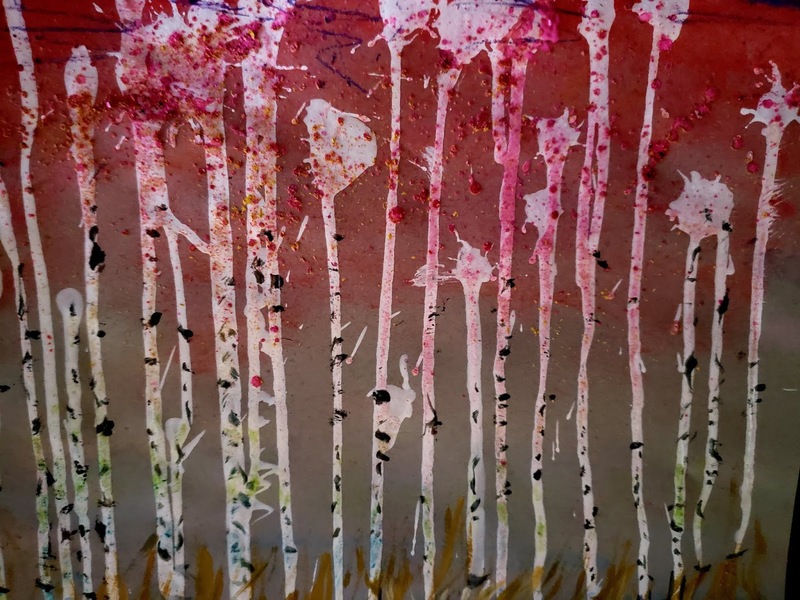 Keep adding your birch trees across the paper. 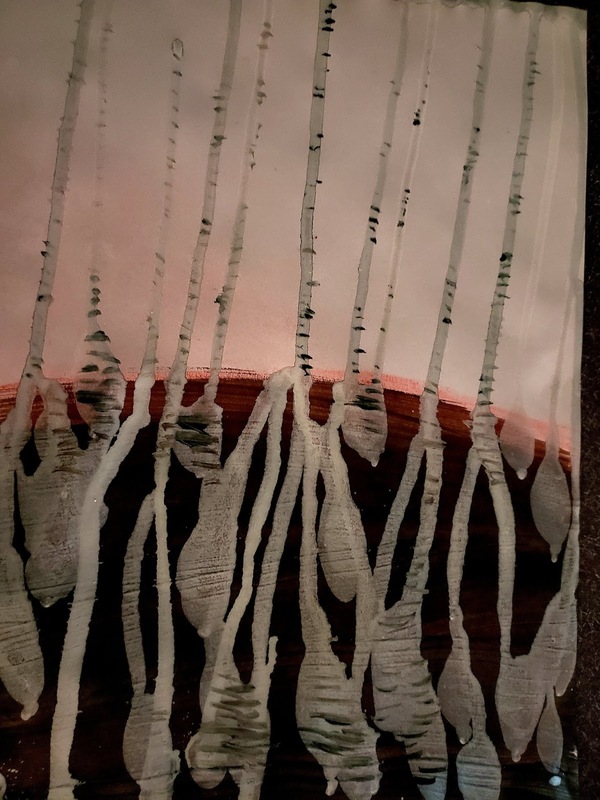 When you have enough birch trees covering your paper, set it aside until dry. Then, you can add details. Older kids especially like this step. Using a fine brush, paint the black horizontal stripes that birch trees have. You can add other details, too, like shadows, speckles of paint or anything else you can come up with! And then your birch forest is done! My older daughters (12 and 14) enjoy making these, but I think 6 and up would be a good age for this project. My 3 year old enjoyed painting alongside us, though! Let me know if you make a birch forest. I’d love to hear how they turn out!